The gastronomy of Totana is renowned for the simplicity of its dishes in which both elements of traditional cooking and nouvelle cuisine are combined. 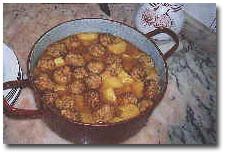 Tradition dictates a style of cooking which is heavily influenced by the passing of the seasons and festive days and also makes great use of the produce of the celebrated Murcian huerta: such as the famous pumpkins grown in Totana, aubergines, artichokes, courgettes, green pepper, pulses and rice. All this without failing to mention meat, especially rabbit, and flour which is used to make porridge. 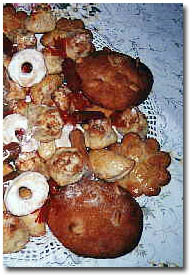 In order to comprehend the socio-cultural importance of the gastronomy for the inhabitants of the area, we could refer to the 'tortas de pimiento molido' (typical ground pepper pancakes), 'chicharrones' (pieces of pork) which together with a café con leche make a typical leisurely breakfast. Another time-honoured custom, to be enjoyed amongst friends , is that of the midday 'aperitivo' (aperitif) which traditionally includes beer, wine, the typical dish of michirones, cod with tomatoes, fried almonds, the various renowned sausages of the region and, and always eaten lastly, dressed lettuce hearts. 'Migas con tropezones' (fried breadcrumbs with small pieces of meat) is another typical dish which is eaten all year round. Rice dishes of all different types are also popular, as are dishes based on meat, especially rabbit, which can be cooked in tomatoes, with garlic etc. An established ritual, which takes place in winter, amongst families in Totana is that of the 'matanza del cerdo' (the slaughter of the pig). This takes place towards the month of November and has brought about the popular saying 'Para San Andrés, mata tu res' (Kill your beast for Saint Andrew). This means that the family larder can be stocked for the coming winter and all the typical sausage meats can be prepared. And all this serves to contradict the timeworn proverb which reads as follows: 'En Totana donde se acaba el pan antes que la gana' (In Totana, where the bread runs out before it fills you up). Stews are also popular and be served with meatballs or, more typically, vegetables together with beans, chick peas, prickly pears and pork. Rice dishes can contain meat, vegetables or snails. Once spring and Easter have arrived, the gastronomy of Totana relies even more heavily upon a wide variety of both fish and vegetables, cod cooked with tomatoes is amongst the most popular dishes of the region. The summer diet is lighter and is largely based on cold dishes such as salads, fruits from the huerta with the most typical dish being salted sardines served with fried eggs. On Sundays throughout the year, most families sit down to rice with rabbit followed by figs with almonds or rice pudding. Another popular practice is to enjoy some buñuelos (typical doughnuts) late afternoon. 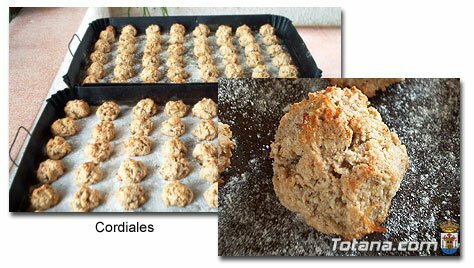 Whilst on the subject of confectionery, we must mention the mantecados (lardy cakes), tortas de Pascua (Christmas cakes) and other festive treats such as liados and cordiales which are baked by the housewives of the region for the Aguinaldo (Christmas box). This custom is undoubtedly one of the oldest gastronomical traditions in Totana. 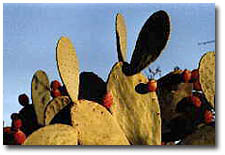 As far as drinks are concerned, perhaps the most typical is the famous revuelto (meaning mixed up or confused) which as its name suggests is a mixture of anis and dessert wine. Other traditional drinks are paloma (white anis), which can be mixed with lemon syrup and then becomes known as canario. Tradition has it that a long time ago there was a mighty summer storm in the town of Totana, which swept away some of the fields, as a consequence the figs trees were left almost entirely deprived of their most prized fruit. The people of Totana grieved because that year they were not going to have their tasty fruit, but the surprise came when Autumn arrived and all the fig trees produced a second batch of fruit and consequently they were able to enjoy the flavour of their figs. Ever since then the people of Totana on the day of ´San Antonio´ (st. Anthony) throw part of the fig harvest away, as Totana enjoys such a harvest twice a year, in Summer and in Autumn.